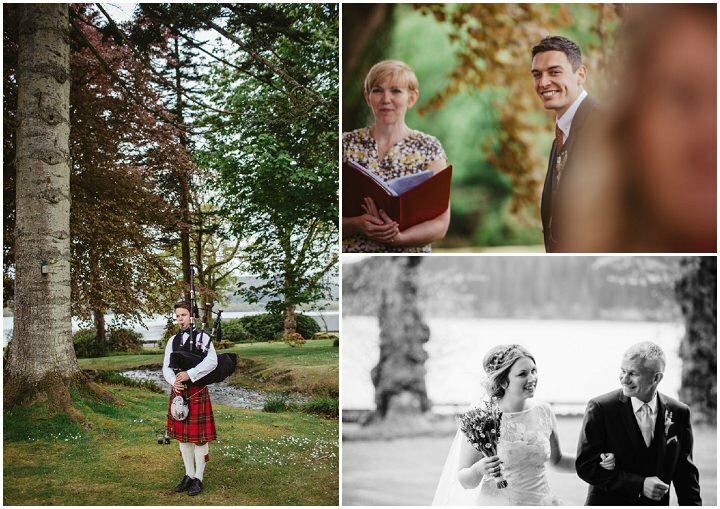 Today I am delighted to welcome back Sarah and Del to the Blog. 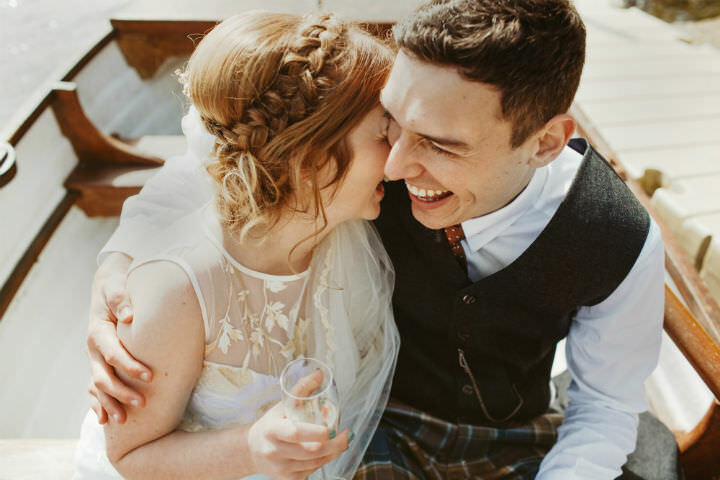 You will remember Sarah and Del from the boho diary feature, they wrote for the blog for well over a year and we learned so much about their gorgeous wedding plans. Well today we get to see the results of all that planning, as I share with you their quite stunning day. 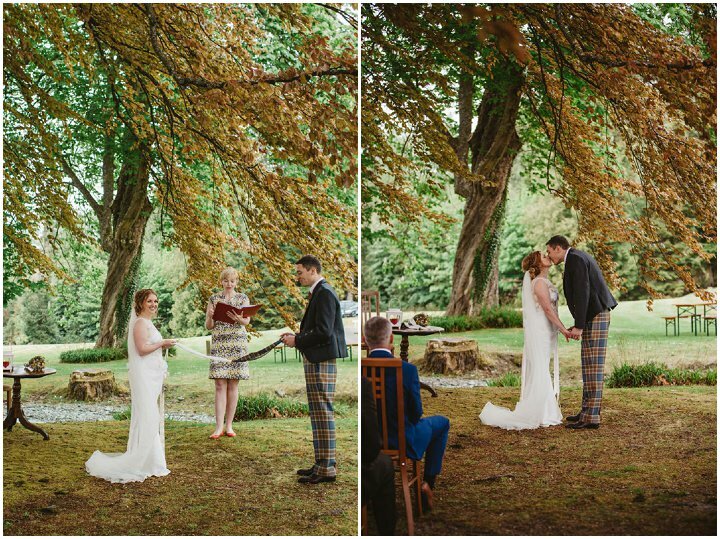 The day has been captured by Christopher and Gillian from Christopher Currie and the results are beautiful. 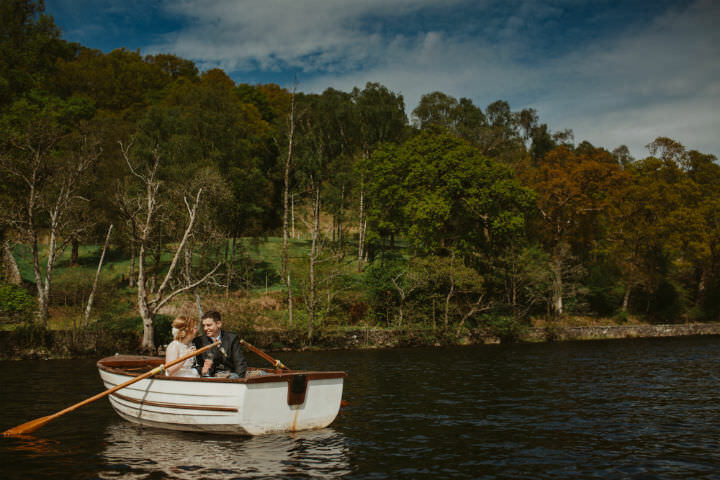 With an Outdoor humanist ceremony along the banks of Loch Ard in Scotland the backdrop is pretty jaw dropping. 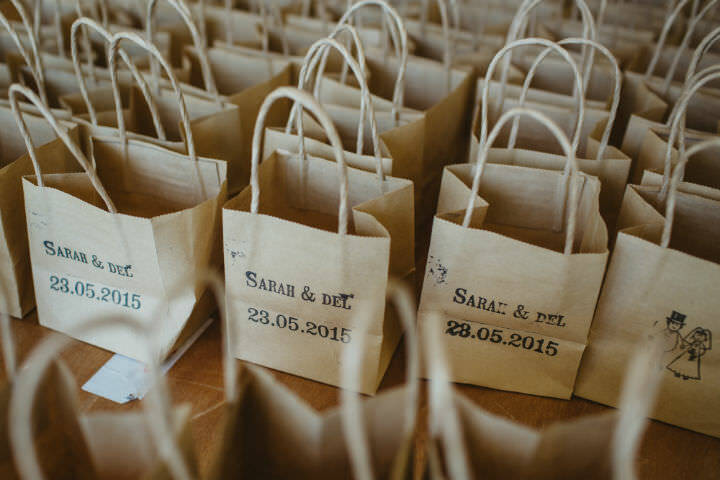 With lots of handmade projects and pretty details both Sarah and Del have put together an amazing wedding. 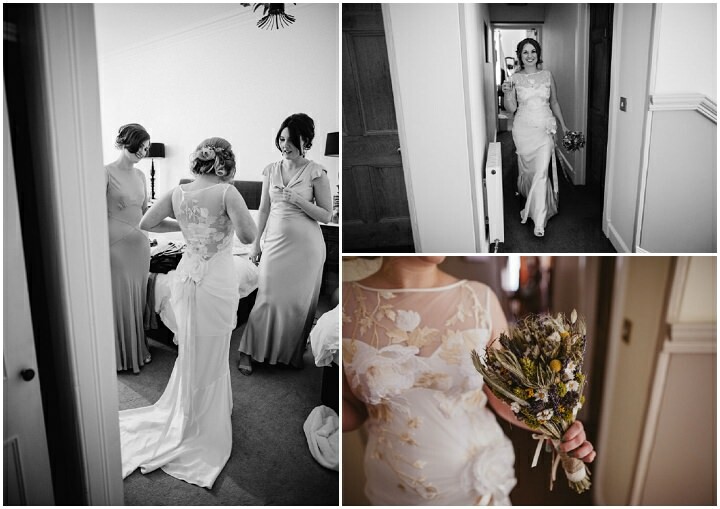 As for that Claire Pettibone Dress Sarah…Wow!! 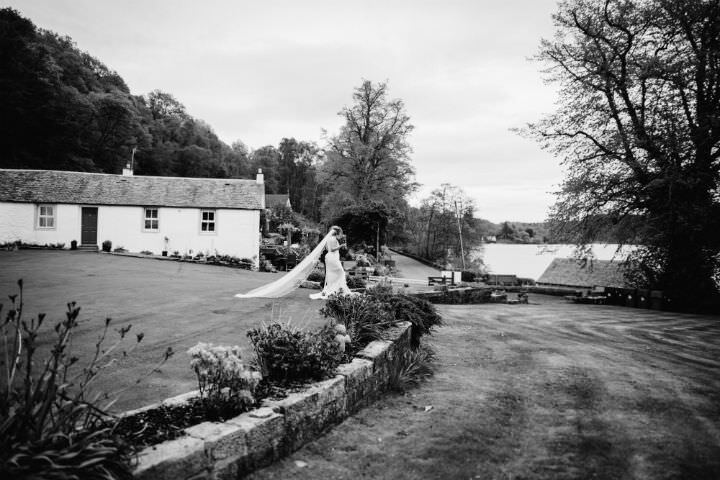 Sarah and Del were married on 23 May 2015 at Altskeith House, Loch Ard. ‘The venue hunt took quite a while as we just couldn’t decide what we wanted. 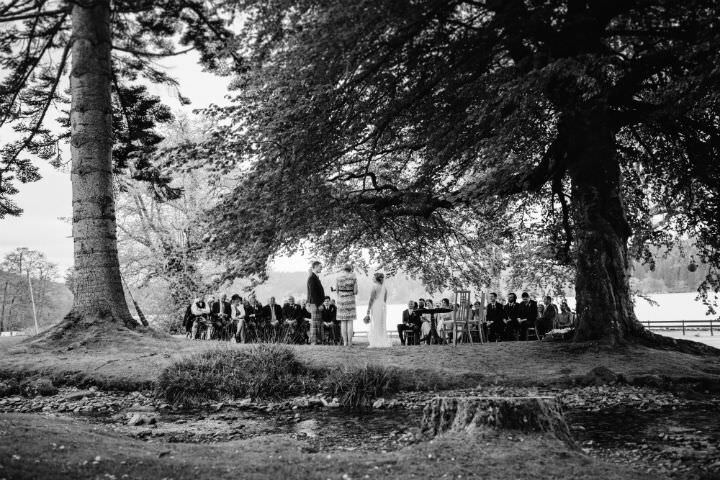 At first we were looking abroad as we love to travel but we realised that although it might have cost us less for the wedding (although not in Ibiza! 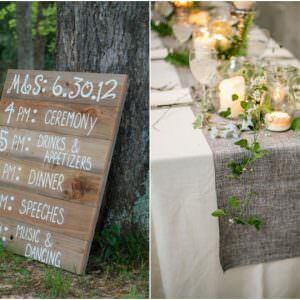 ), the guests would have had to pay a lot to attend and so that took away one of the biggest benefits. 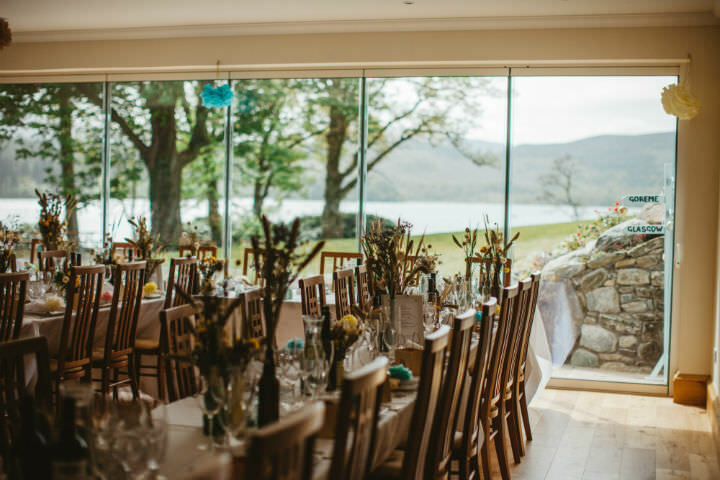 We realised what was important to us after this – we wanted an informal day, relaxed, preferably outdoors, enough accommodation nearby for guests to stay in and somewhere that was flexible about suppliers. 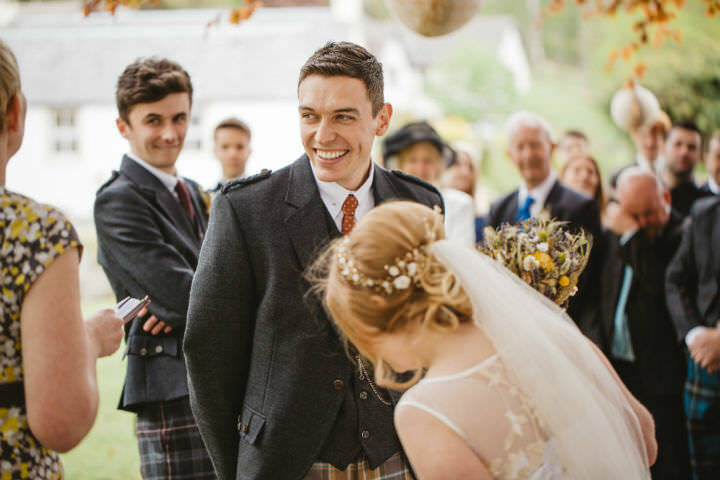 The legal restrictions on marrying outdoors in England pushed us more towards Scotland where your celebrant rather than venue is licenced. We’d organised a trip to Scotland and had booked in to see Altskeith on the way up as a potential site to place the tipi. The scenery on the drive there was beautiful, and even better when we arrived at the house. The loch, which is right across the road from the house, was so still and the atmosphere was so peaceful, we loved it straight away. 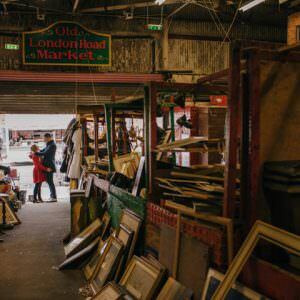 We loved the place, we had a pick of many dates, and we weren’t charged extra for marrying on a bank holiday weekend which was a bonus! We booked the full house with ten rooms out for four nights for the wedding weekend. We had around 80 guests, with only a few more joining us in the evening. We got engaged in June 2013, and started looking for a venue in August. 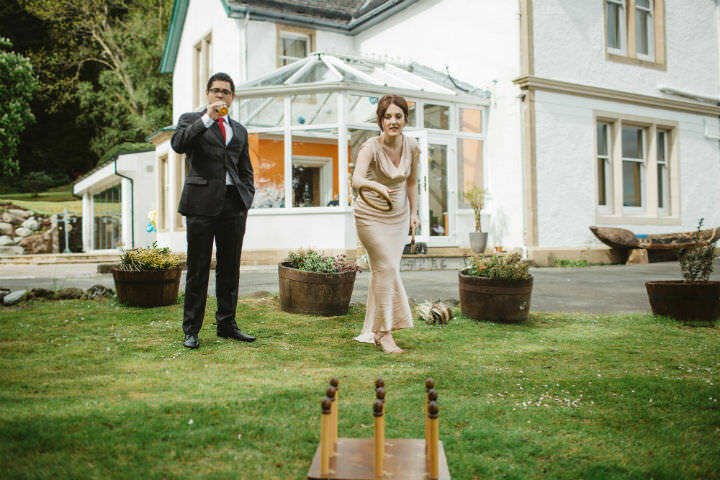 Once we had booked the venue and photographer, we took some time off and planned in fits, We also moved to Glasgow 6 weeks before the wedding, so definitely planning in dribs and drabs. 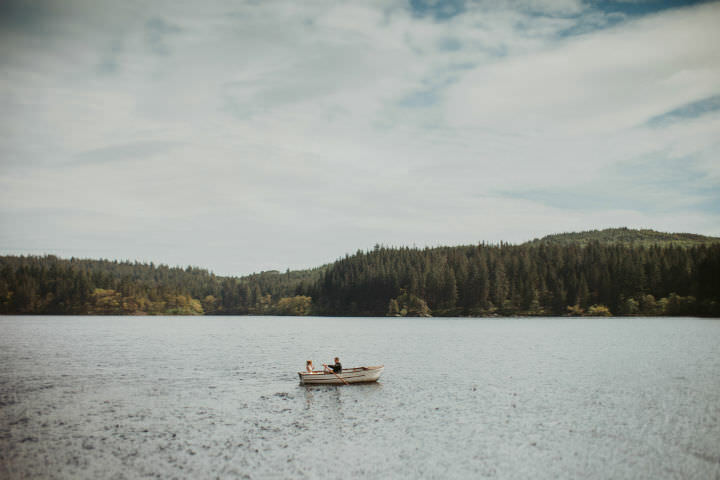 Sarah: Del was very sweaty and more nervous than usual on a flight to Madrid, then dragged me to my favourite park, took me on a packed rowing boat lake, to a packed café, wandered around some packed boulevards, then found a secluded corner and proposed with an amazing ring. Apart from him actually proposing the biggest surprise was he’d got a ring – if it ever happened I’d expected an I.O.U. or a Haribo ring! Del wrote a blog post about proposing – you can read it here. Sarah: We love going on holiday so splurged on the honeymoons. We’re looking forward to our Sri Lanka adventure and had a fab minimoon in Paris after the wedding. 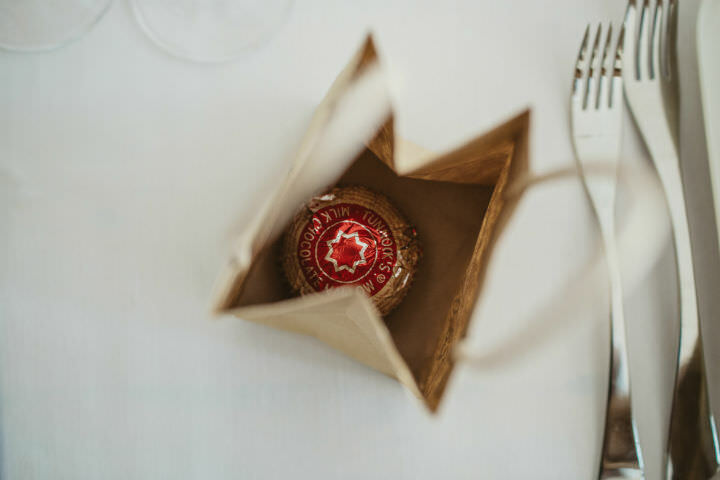 My wedding outfit was a big splurge, and I have a big tip for brides-to-be – don’t go veil shopping tipsy! 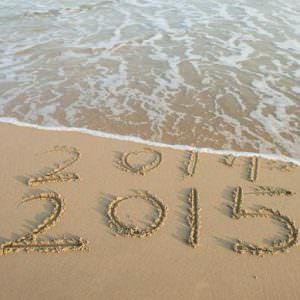 We saved by not having band or dj – we used a playlist and this worked really well. 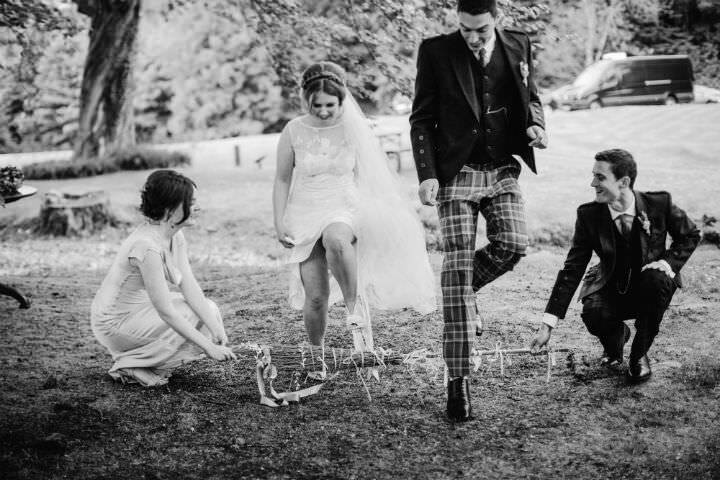 As we were all in one house we didn’t need wedding cars, although I suppose we spent that money on a bus to and from Glasgow for our guests. 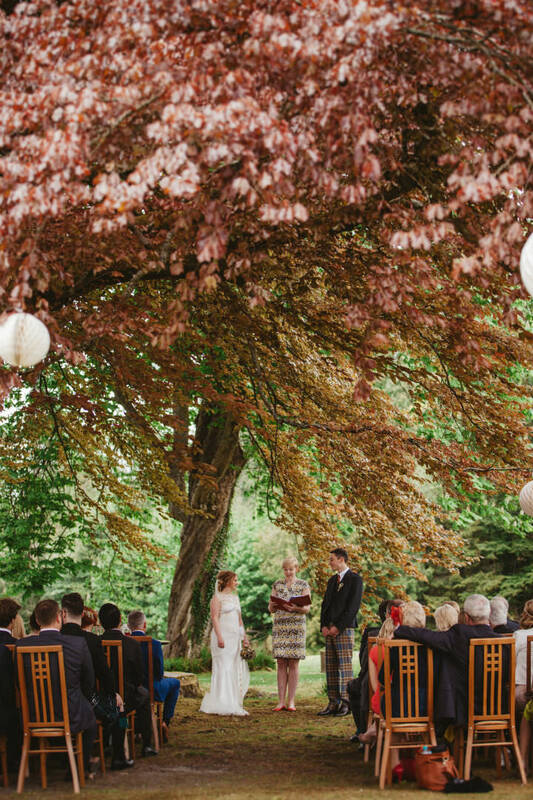 We saved a little by using dried flowers (although we didn’t do this to save money). We bought bouquets and buttonholes online, and arranged the table flowers ourselves. 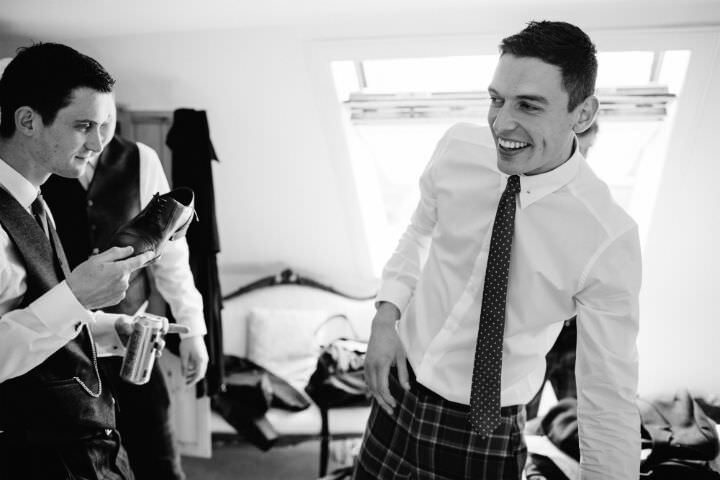 Del: Chris & Gillian had photographed my friend’s wedding, and Sarah loved the style of the pictures. 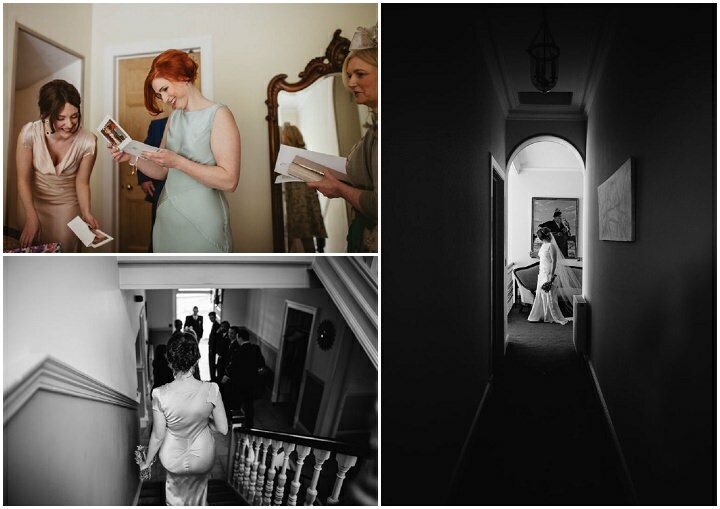 They always shoot weddings as a pair, and we really liked this idea of having two photographers so they capture different perspectives of the day. 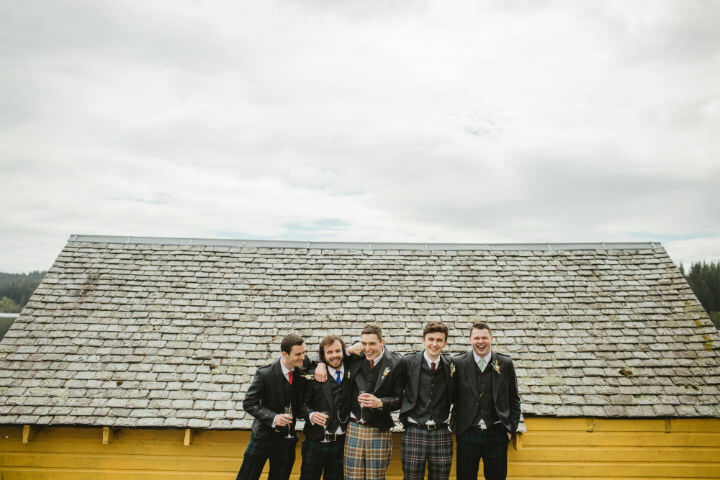 We spoke to a few photographers, but felt we got on well with them best so booked them. 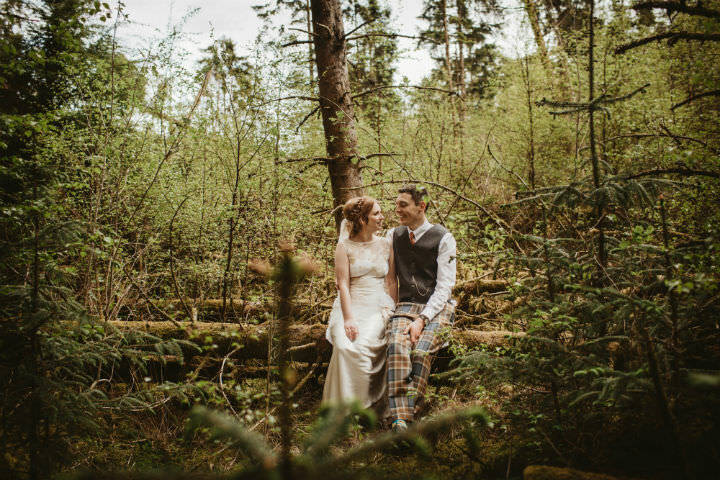 Chris & Gillian are a couple around our age, and they got married the month before us, so we felt we could relax around them, which was also really important to us. 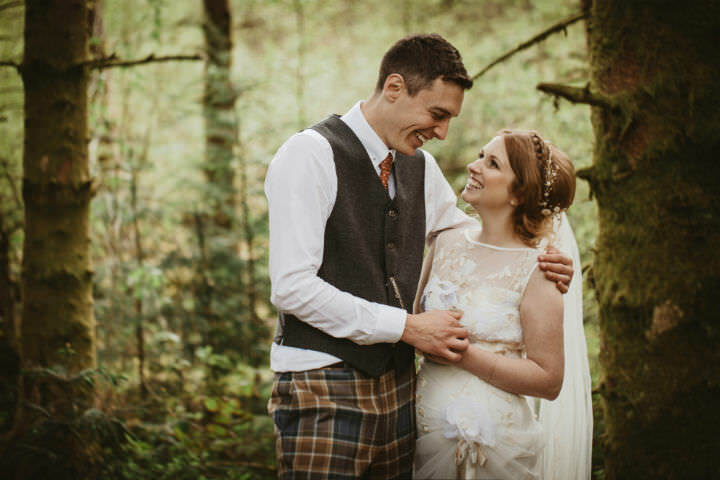 Sarah: My dress was Willow by Claire Pettibone and I got it from the White Closet in Didsbury. 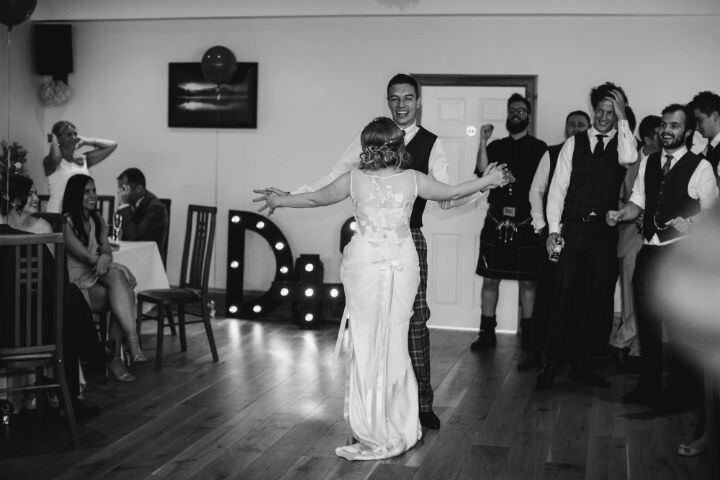 I was very sceptical about the whole ‘the one’ thing with your wedding dress, but the dress makes me feel amazing when I put it on and I absolutely love it. 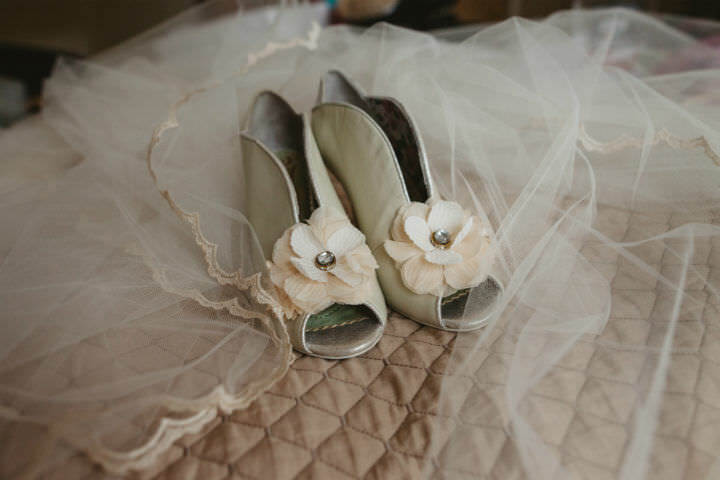 My shoes were Poetic Licence by Irregular Choice, I had another pair which I also love, but they were too uncomfortable so I stuck to the one pair. My lovely hairpiece was from Debbie Carlisle who I had the pleasure of meeting at a White Closet accessories event. 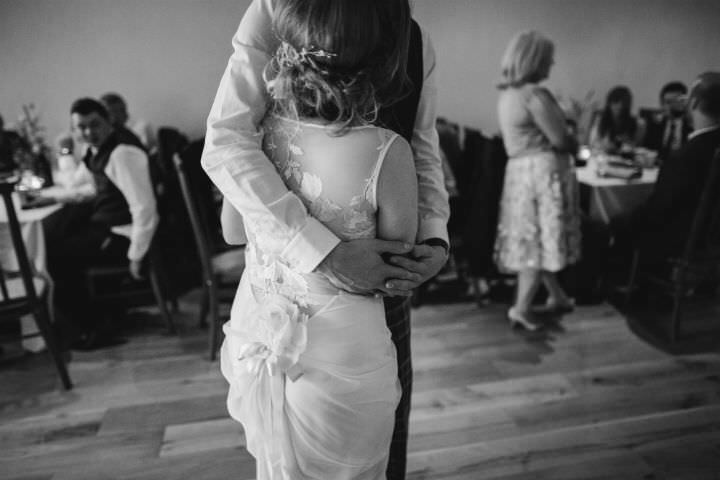 I also had a cathedral length veil, and spent most of the day carrying under my arm so it didn’t get damaged as I loved it so much. I wore earrings by Marie Canning, my bracelet belonged to Del’s gran who passed away just after we got engaged, and I also had a new Sarah Brown ring which Del bought me as a gift. 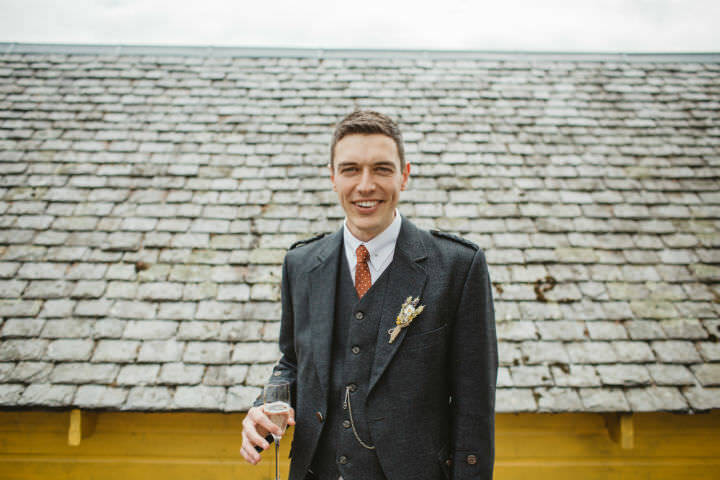 Del: I wore a charcoal grey kilt jacket and waistcoat, Manx (hunting) tartan trousers (not trews) which were made specially at my local kilt shop. I got a nice Reiss shirt, and as a present Sarah got me a new watch which I wore along with the pocket watch I was so desperate to wear. My parents also got me a pair of the dearest shoes I’ve ever had…and will ever own, the deep red went really well with my outfit. 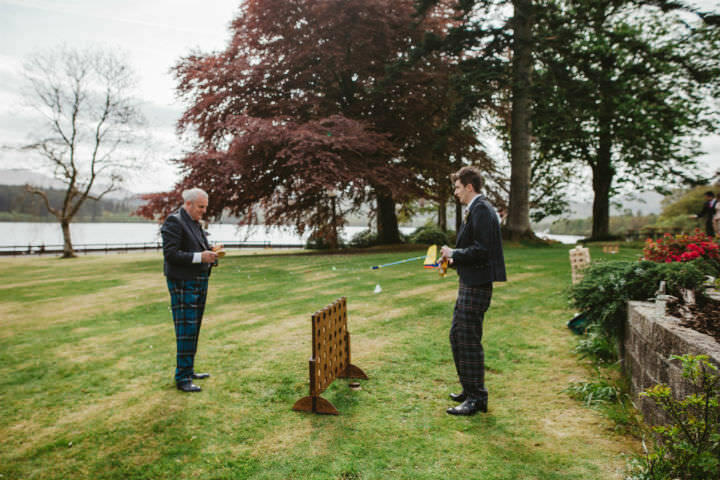 The best man, my Dad and Ushers all wore tartan trousers as well in different patterns, felt very smart but also fun. Sarah: The bridesmaids had Ghost dresses. 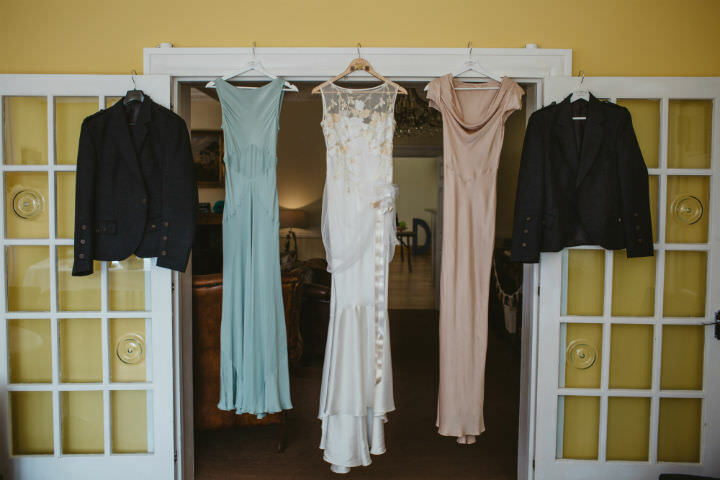 I have quite strong feelings when it comes to bridesmaid outfits – I think your closest friends should be able to feel as confident on the day as you. So from the start they were to pick their own dresses, hairstyles, bouquets etc. The decoration was a mixture of our travel theme and crafts in pastel and gold shades. 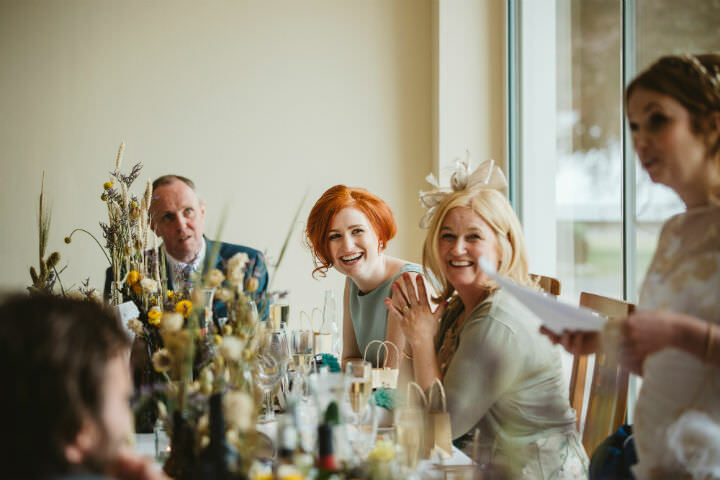 We made a lot in the run up to the wedding, but it was mostly paper pom poms, decorated glass jars, cross stitches, lots of maps and dried flowers. 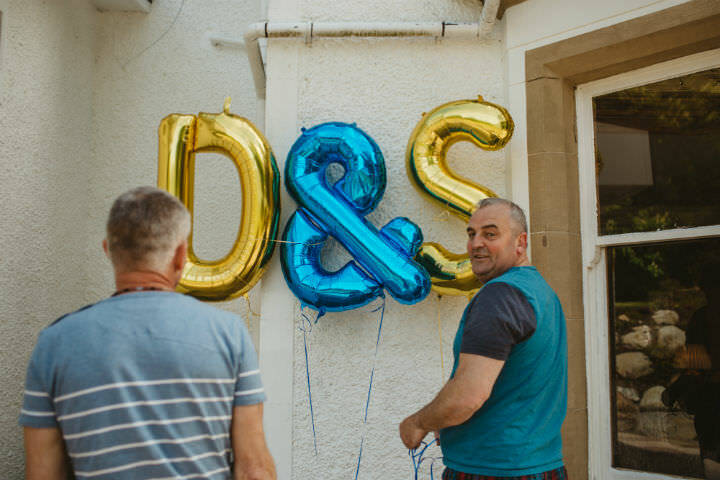 We had some big balloons in our initials which our Dad’s blew up, but they deflated in the wind before the ceremony was over! Del:The food was delicious! 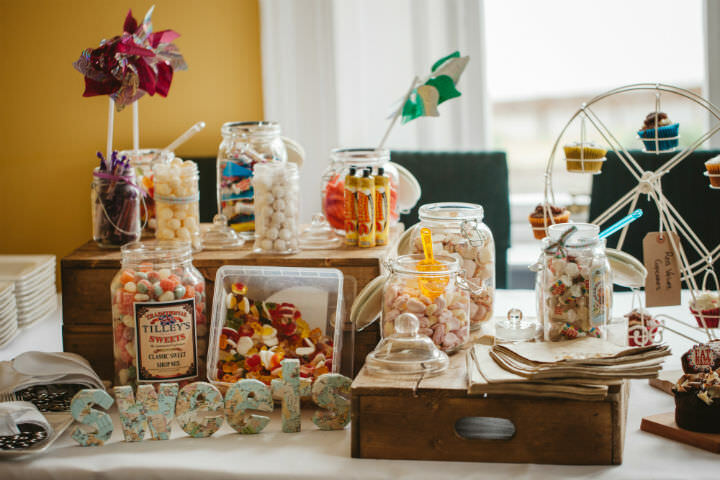 Our caterers Bespoke were absolutely fantastic, and made some Spanish themed canapés, and an Italian inspired meal. We especially loved the sharer boards for starters, and, Chris and Kelly were even kind enough to source (& buy) us a holder for our leg of Serrano Ham, and made Sarah her favourite rose and lychee martinis throughout the day. 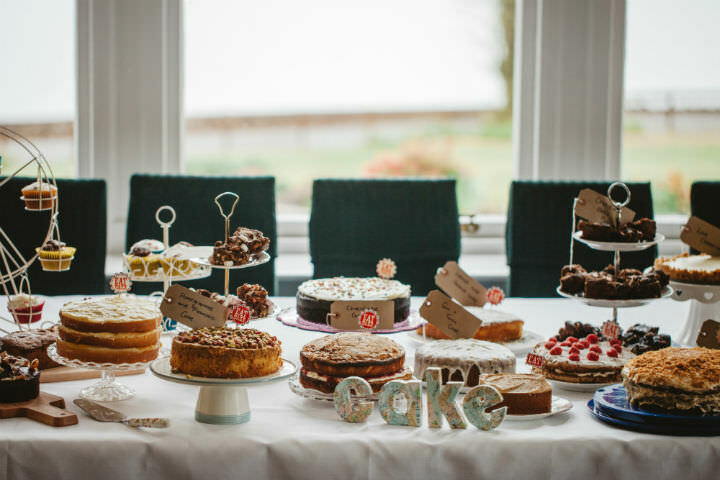 As Sarah loves to bake we asked guests to bring a cake if they could, and ended up with a huge cake table for dessert. We also ordered cheese from a local shop in Glasgow for those who prefer savoury to sweet, or in most cases had both. 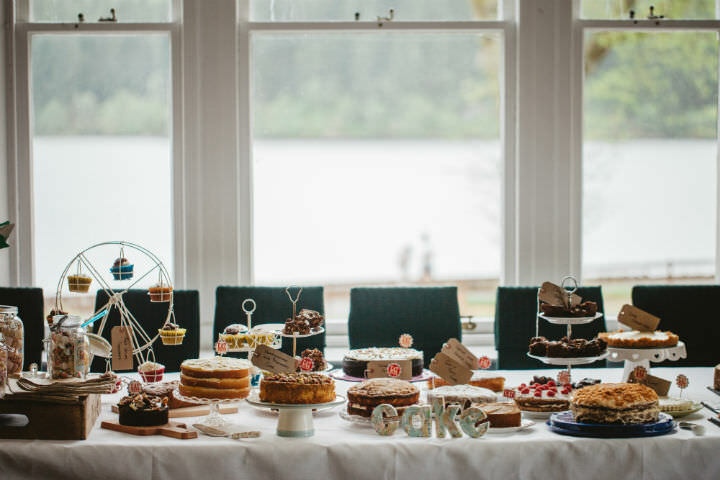 Sarah: We had a three tier naked wedding cake from the Big Bear Bakery in Glasgow. Each tier was a different flavour as we couldn’t decide on just one. We had chocolate & raspberry, rhubarb and custard, and lemon and blueberry layers. 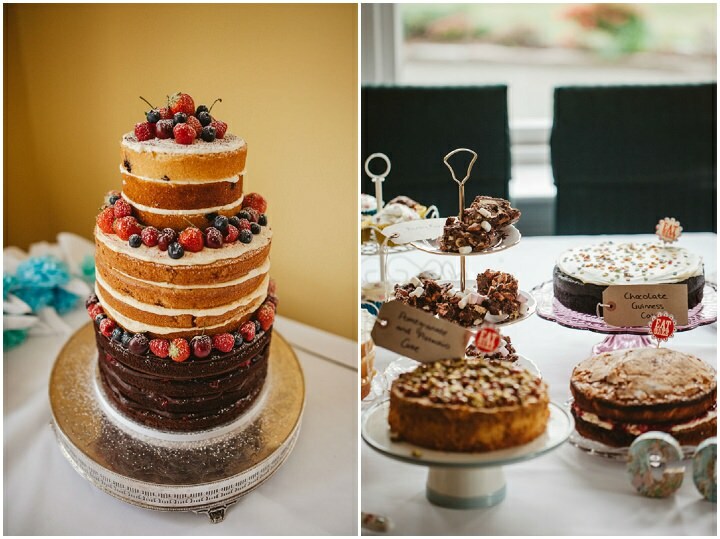 It’s the best cake I’ve ever tasted, especially the rhubarb and custard! Del: We didn’t have any as we decided to just have a playlist which went down really well. Lots of my chill out /sunset music during the day as background noise and then at night a real mixed bag from Cheryl Lynn – “Got to be real” – to Daft Punk and Hot Chip! 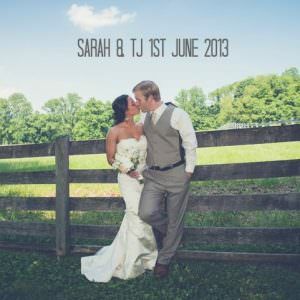 We made our own save the dates, and everything else was done by Andrew Edwards. 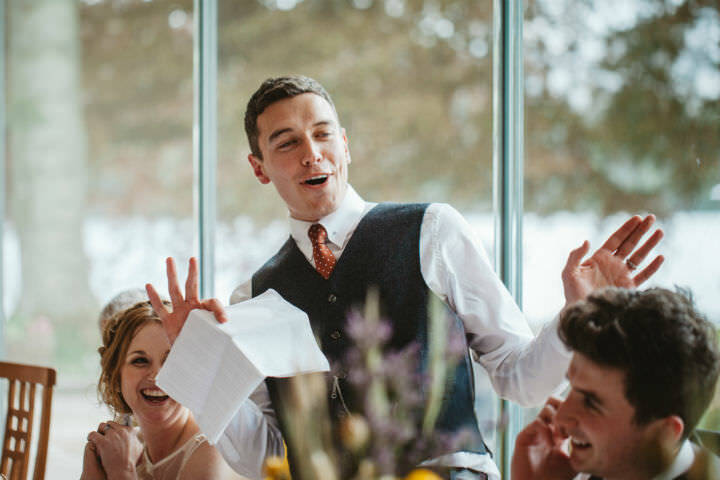 He was fantastic – we were pretty vague about our ideas but he managed to create invites that were even better than we could have imagined. 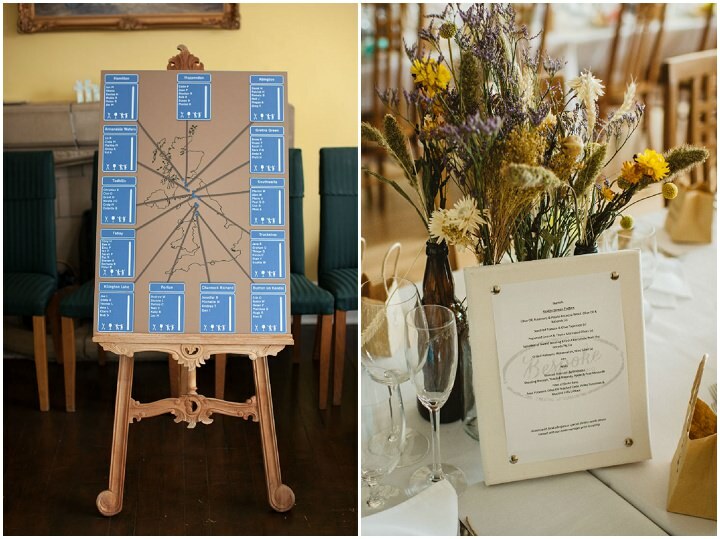 We loved the table plan too. We named the tables after motorway service stations along the route between our two homes when we first met. Andrew designed a map indicating where each service station was, and made each table list look like a motorway sign – it looked fab! 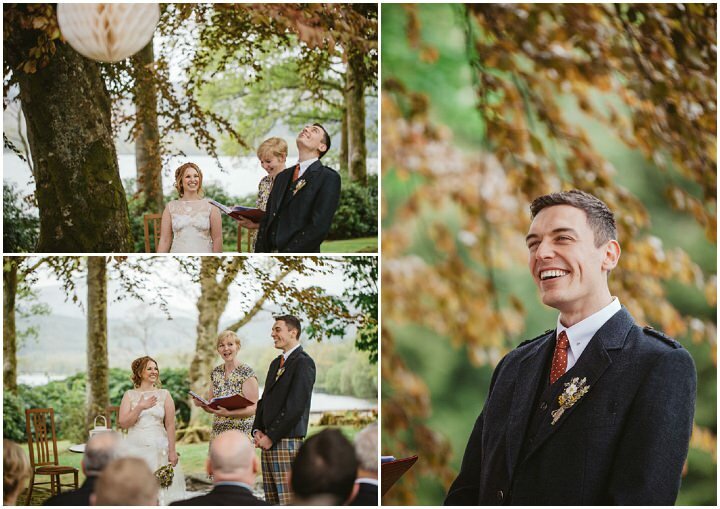 The entire day was very much personalised, but our Humanist wedding ceremony was probably the most personal to us, and probably the best part of the day. 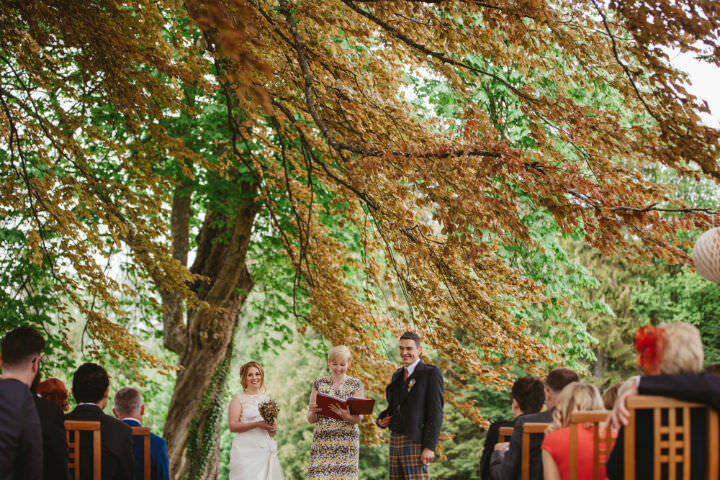 Our celebrant Claire was so lovely and so funny. It was really personal to us, and we wouldn’t have had it any other way. We, and the guests, were laughing our heads off throughout, and we can’t thank Claire enough for all that she did. Our Grandad’s each did a reading, which is even more special now as sadly Del’s Grandad recently passed away, and our Mum’s took part in the hand-fasting part of the ceremony. 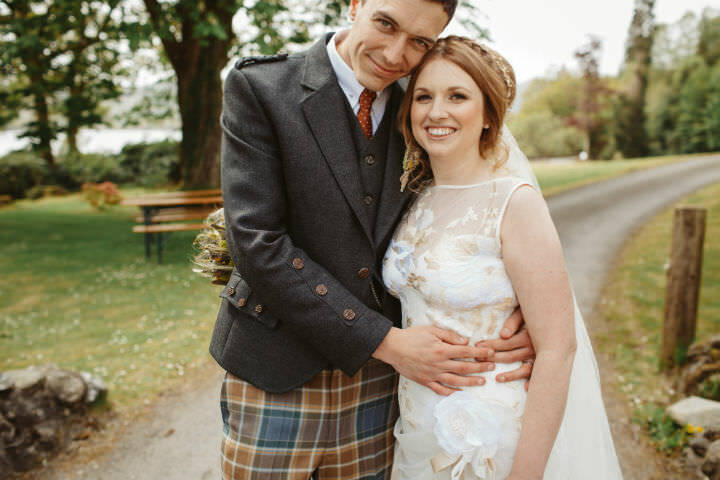 Sarah: We did a lot of DIY, although I probably spent way too much time pinning and not enough making, as we ended up making most things in a rush in the last couple of months before the wedding (whilst we were also moving house). We arranged the flowers the day before, which took a considerable amount of time with lots of family and friends pitching in the day before the wedding. A lot of the vases and candle holders were crafted by my sister in the months running up to the wedding. We even had Del’s brother making paper pom poms with us the Monday before, and I had friends round doing crafts a few times too. One of my favourite ideas at the time was to spray leaves gold – we used these as placenames by writing names on each. I also developed an obsession eith origami too! With a lot of my ideas, at first I didn’t know what we’d use them for, but we found a use for almost everything we made – probably not the most effective method, but I had lots of fun crafting! 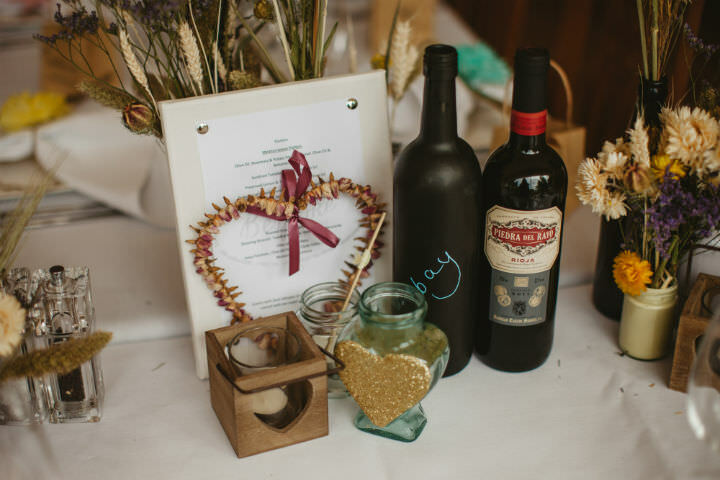 Del: Sarah’s Dad made a D & S with lights on it, which looked great and he made little crates for the confetti cones – we asked him to make them look rustic and he got them spot them using pieces of old fence panels. 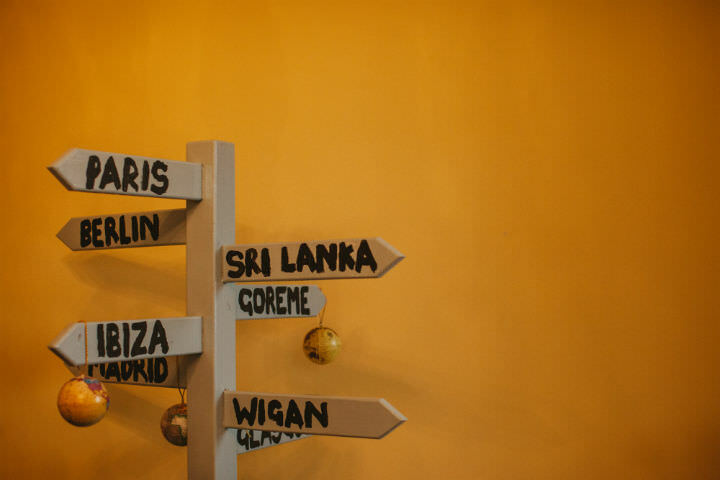 My Mum and Dad made a signpost that pointed to places we have been and mean a lot to us. Sarah’s mum stitched bunting and her sister made everything glittery, including her living room wall. 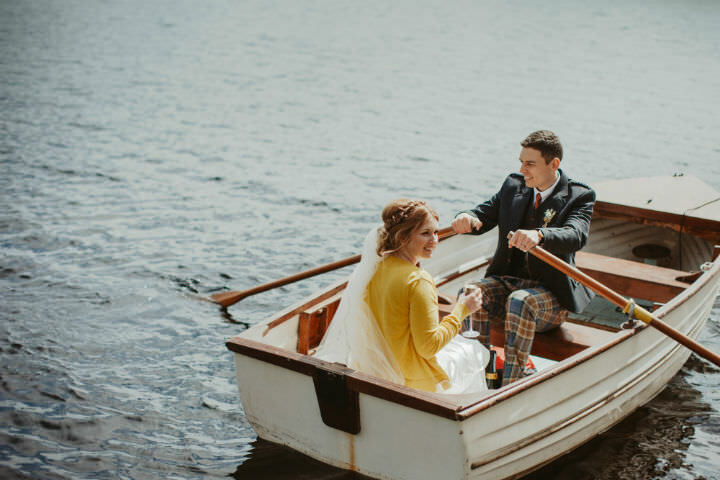 Del: The highlight of the day was when we got on the rowing boat with a bottle of champagne and had 30 minutes to ourselves it was a special time where we both were so happy and content in each other, with everything else going on around us. 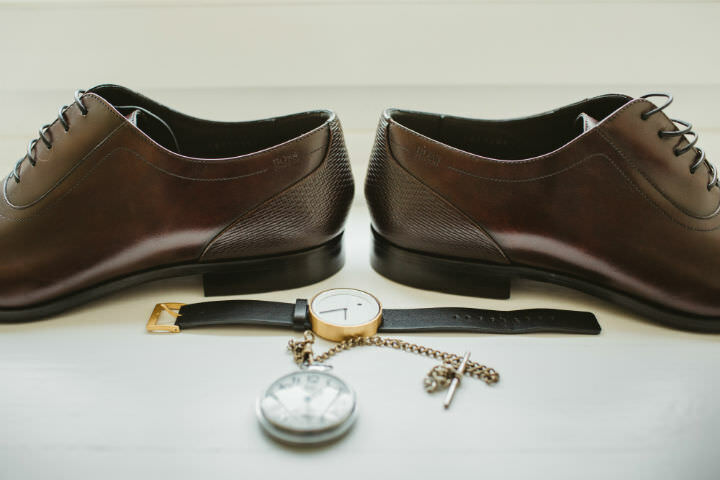 Sarah: The calmness of getting ready was great after months of running around – I could see the guys running around mad while I finally had time to relax! 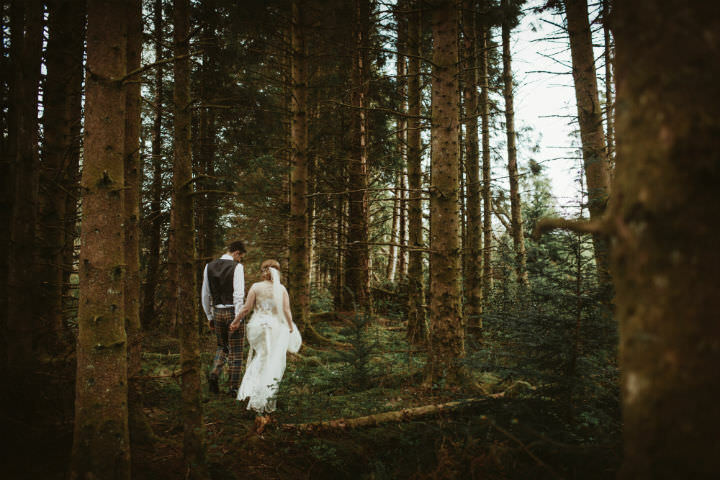 I also really enjoyed going off to the woods to get some photos done – it felt really fun to be in such a messy place in a wedding dress, and also meant we had a bit of time alone together. Del: Start well in advance, don’t worry about the things you can’t get round to doing. Enjoy what you achieved in terms of how you wanted it to look, and forget about it on the day of the wedding and just have fun. Don’t be too serious, calamities are the bits you remember. And enjoy the day together as you will not be involved with everyone else’s day as you think. Sarah: Don’t be too hard on yourself. Try to be realistic about what you can achieve in your planning, and if you don’t manage to pull things off, don’t worry about it. 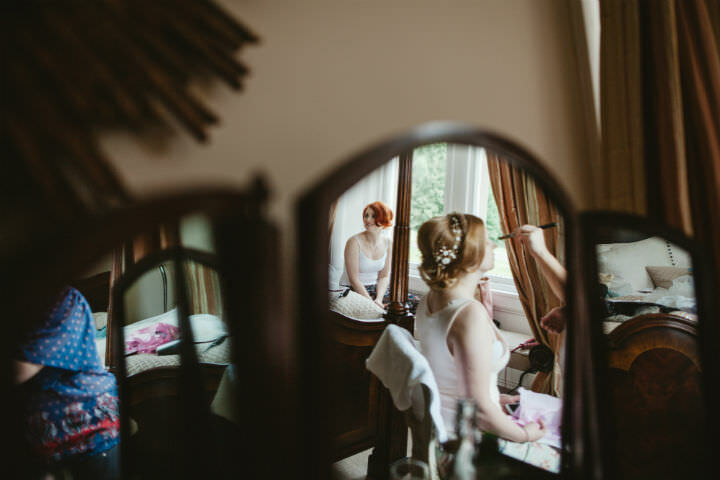 And remember to be yourself – if, like me, you’ve always been a last minute person, you’re likely to be running around last minute for your wedding. It’s not ideal, but that’s the way you are so it’s best just to accept that than try to arrange things to be completed early but then still be running around mad the day before and feeling bad about it. 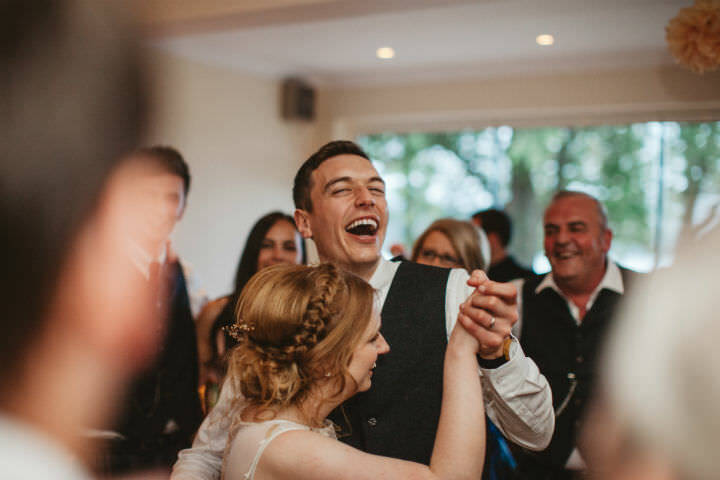 I was exhausted by the evening at the wedding because I am the last minute girl, but that’s just who I am and I couldn’t have done it any other way. Sarah: How I felt on the day – I wasn’t nervous at all, I was really chilled which was unexpected. 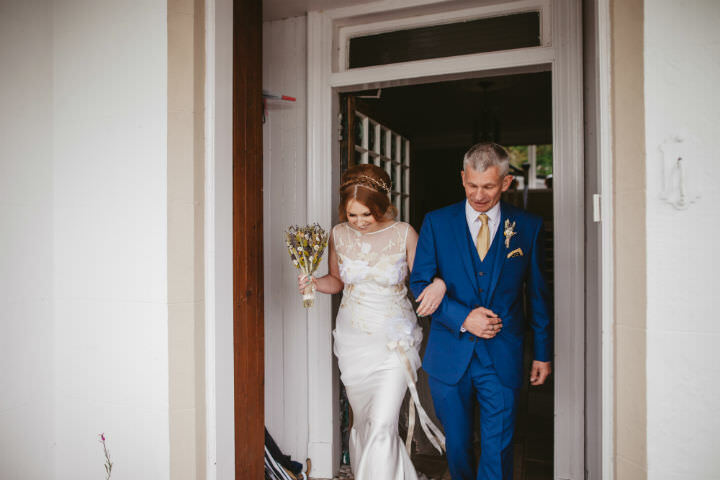 I was much more excited than anything else and it just felt right to be doing it – what was there to be nervous about?! 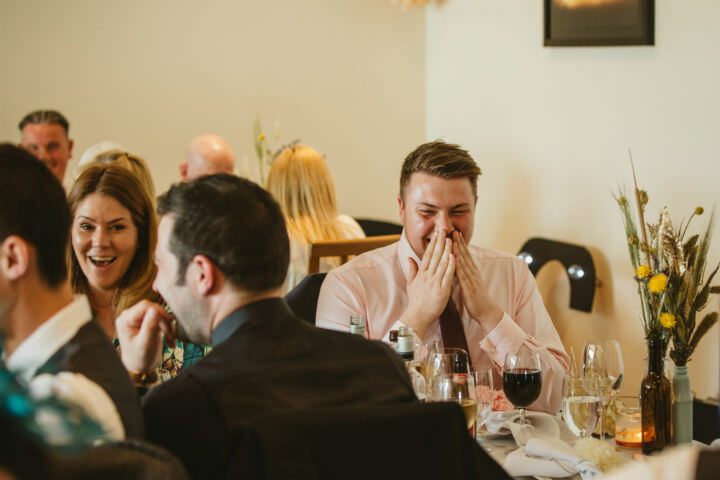 I was also surprised that it felt different to attending somebody else’s wedding. 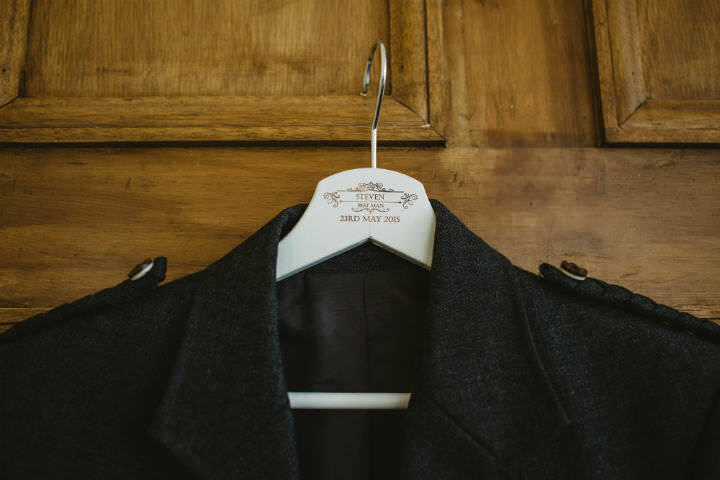 It’s hard to explain, but a few times during the day I found myself waiting in another room to the guests and it felt as though I was part of a different day to them. 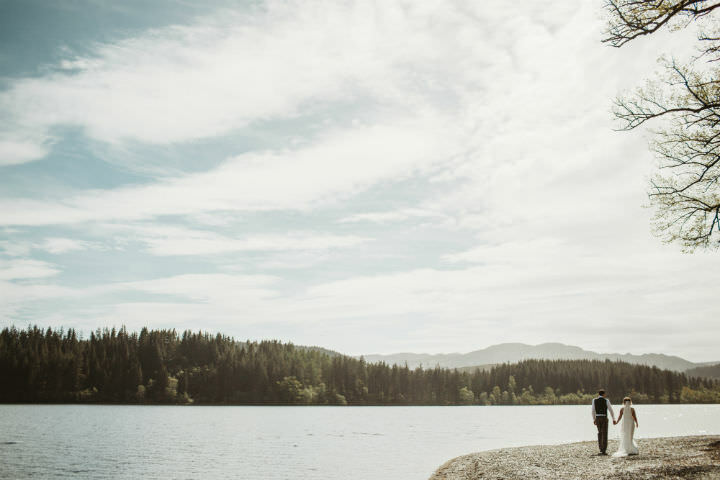 You forget that everybody is here for you, and so you are the person that waits until everybody else is seated and then you walk down the aisle. It sounds silly but I didn’t expect it – clearly hadn’t thought about it! The weather was also a very nice surprise. Del: The day went so fast, I couldn’t believe it. It’s probably because I was running around like a maniac on the day of the wedding. I believed that we shouldn’t sleep in the same room the night before the wedding, Sarah was totally against this idea, so we ended up waking up together and having breakfast together which was a real nice touch. I was surprised by how comfortable I was on the day. I thought I would be nervous and worried about everyone enjoying themselves…after a while I didn’t care, probably because they were having just as much fun as me. 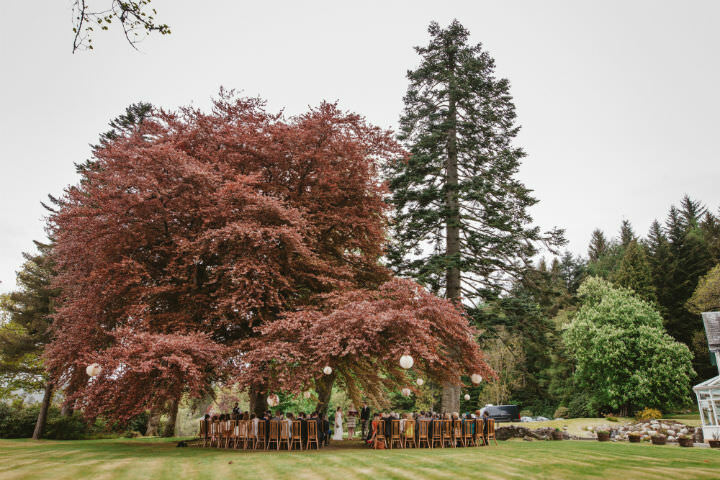 Loving the autumnal vibe and colours of this real wedding and that Claire Pettibone dress is divine!! 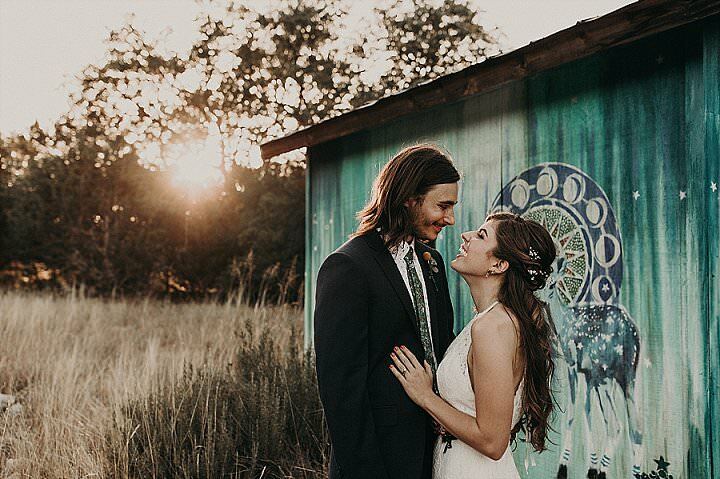 Loved seeing how this couple brought their wedding vision to life. Beautiful photos! World-colored hair of bride! Fantastically! 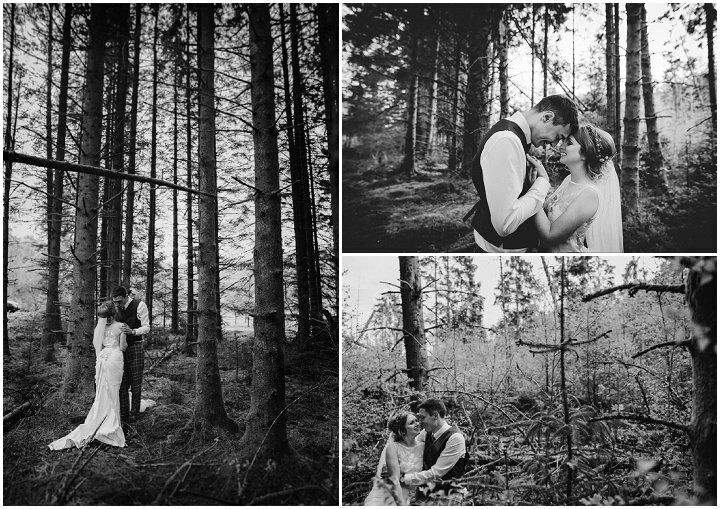 Beautiful autumn, beautiful love, unusual wedding… Great session!